версія 2.0.0 (beta) від 12 березня 2019 р.
AdGuard for Mac traditionally doesn’t receive frequent updates, but when it does, it is usually something big. This beta is not an exception, we present to you not one, not two, but three big changes, each one of them would normally be enough to justify a beta update on its own. These changes are CoreLibs integration, new UI and the introduction of Stealth Mode. Let’s jump inside and look at them more closely. This is the first AdGuard for Mac beta that introduces CoreLibs — the new filtering engine that lies at the core of the filtering process. It is not random that we put this before such huge news as Stealth Mode or new design. The effects of this change will be both big and long lasting. 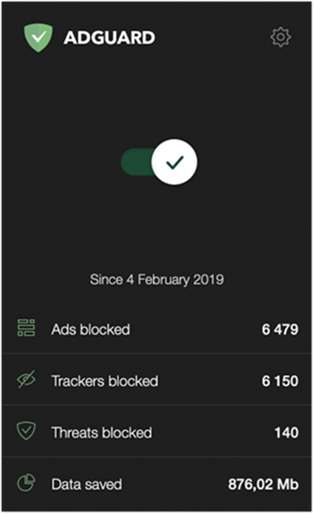 CoreLibs significantly enhances both ad blocking quality and performance, in comparison to the latest stable version. And since CoreLibs is a cross-platform filtering engine, in addition to these obvious improvements it allows to implement more new features that previously were only available in other AdGuard products. Worth mentioning that AdGuard for Mac becomes the second AdGuard product to receive the “CoreLibs treatment” after Adguard for Android. Stealth Mode is a special module which sole purpose is to protect your online privacy. It went a long way from an obscure, Windows-exclusive feature, to the centerpiece of almost any AdGuard product in the very near future. This is a logical flow of things as the value of privacy has been rising to the sky for some time now, and the need to protect it becomes apparent. If you had a chance to use AdGuard for Windows, you will find inside all familiar options. We’ll not clog up the changelog by describing every single one, they are all explained in the tooltips next to them. Finally, we get to the new UI. You may be baffled why it was left until the very end of the changelog, the explanation is very simple: the changes are modest. Both the main screen and the settings menu look different enough, but you won’t have to re-familiarize yourself with the app. Think new, prettier icons, honed styles and so on. One thing that stands out is the new Assistant, it is miles ahead of the old version in terms of convenience, and allows you to access the web reporter for any filter-related issues on the web pages. Oh, and another treat, exclusively for Mojave users who prefer dark themes. AdGuard now supports the dark theme, so if you switch to it in your Mac settings, AdGuard will no longer be a black sheep among your applications, pun not intended. New users will also be greeted with redesigned onboarding screens. They are made more informative and help make first steps and adjust AdGuard according to your needs. версія 1.5.13 (beta) від 13 грудня 2018 р.
версія 1.5.11 (beta) від 21 листопада 2018 р. This is a necessary beta version, tonight we will push this beta into release channel. версія 1.5.9 (beta) від 23 жовтня 2018 р.
версія 1.5.7 (beta) від 7 травня 2018 р. This beta brings a hotfix for an issue when a combination of bad connectivity and specific environment leads to blocked network access. We have also made some changes to support the upcoming Japanese translation. версія 1.5.5 (beta) від 6 квітня 2018 р. This update brings just one small fix and becomes our new release candidate. версія 1.5.4 (beta) від 30 березня 2018 р.
It’s been a while since the last AdGuard for Mac release, so we owed one to our Mac users. This beta is small but impactful — or at least we hope so. Some important bugfixes and key improvements have been done. Another bug that doesn’t really require any further explanation, but is serious enough to justify mentioning. In case you encountered this frustrating behavior — rejoice! The bug is fixed in this beta. версія 1.5.2 (beta) від 21 грудня 2017 р.
Ho ho ho! Merry Christmas and happy New Year to all of you! And, of course happy Hanuka, or any other holidays that you may be celebrating these days! A small present by our AdGuard for Mac developers for all of our Mac beta-testers. This beta version holds one major change/improvement, and a couple of minor ones. Details below, as usual. версія 1.5.1 (beta) від 29 листопада 2017 р.
Here’s a first AdGuard for Mac beta in a while. Why are they so rare? Because AdGuard for Mac is nigh perfect, of course! 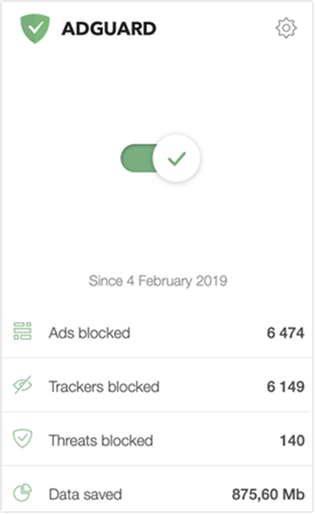 Jokes aside, we did some serious work here, further upgrading the ad blocking and improving the UI. Self-explanatory. Working with filter editor has become so more convenient — trust us, we do it a lot, and we can tell the difference! версія 1.5.0 (400) (beta) від 18 вересня 2017 р. There was an updater bug in the last beta and, unfortunately, an in-app update to a newer version will cause an error. If you are using the previous beta 1.5.0 (395), please download the new 1.5.0 (400) version and replace the old one. Earlier versions are not affected by this bug. The preparation for the release is going full steam ahead, and this update is actually a release candidate. Several bugs of the Filters section interface (#236, #237) have been fixed, we’ve made changes to the spelling of our brand name (#231) and have addressed some of the minor problems. Previously, AdGuard wasn’t able to filter apps installed with WebCatalog, and they couldn’t even be added to the list of filtered apps manually. This issue gets fixed in this beta-version. [Fixed] Several network errors and compatibility issues. версія 1.5.0 (395) (beta) від 29 серпня 2017 р. We keep working on the next release and it is time to introduce a new beta version. Since in macOS High Sierra all system extensions need a special permission from a user, this new version brings a necessary change to Adguard for Mac - an additional startup tutorial (#217). There are also some important security (#224) and performance (#220) fixes along with a UI enhancement: Now it's possible to reset all settings in "Advanced" section of "Preferences" menu (#180). All changes below. версія 1.4.2 (390) (beta) від 11 серпня 2017 р. 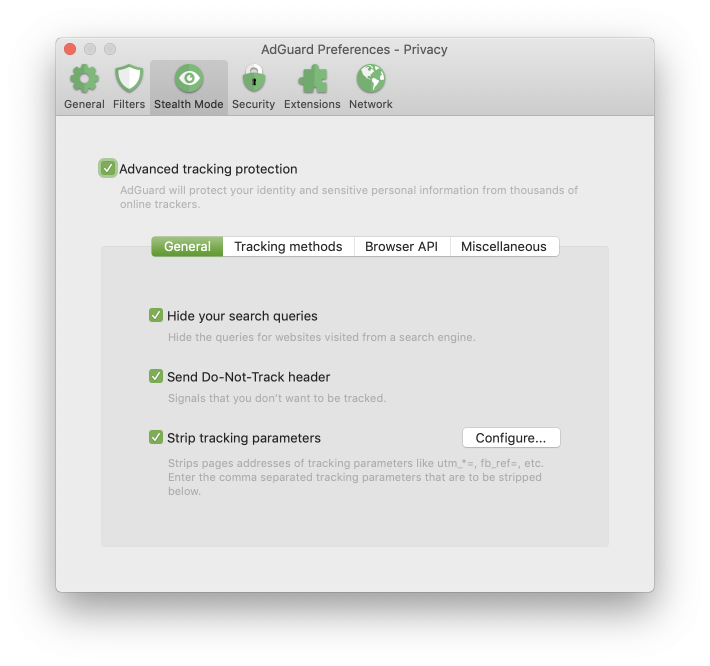 The new AdGuard for Mac beta is a long-awaited one, and we tried to deliver. Basically, all the aspects of the program has been improved: many adblocking-related issues to improve the filtering quality, enhanced network security and reworked User filter. More details below. версія 1.4.1 (376) (beta) від 14 березня 2017 р. A small beta update fixing the certificate issue in latest Chrome version. версія 1.4.0 (374) (beta) від 7 лютого 2017 р.
версія 1.3.3 (beta) від 9 грудня 2016 р. We are getting closer and closer to Adguard for Mac release. This means we don't want any, even insignificant bugs and errors left. This is why we are willing to release beta versions with a changelog this small. To be more precise, this is a release candidate - if everything is fine with it, it will become a new release. версія 1.3.2 (beta) від 1 грудня 2016 р. In this small beta we make several changes, which mostly concern networking. версія 1.3.1 (beta) від 10 листопада 2016 р. It was a long while since the last Adguard for Mac update. We hope it was worth waiting, because new beta adds the support for Extended CSS - read below why it is so important. Besides that, an awful lot of other fixes and changes that will reflect positively on the performance. версія 1.2.2 (beta) від 25 травня 2016 р. New beta features few changes and mostly concerns network issues. версія 1.2.1 (beta) від 22 квітня 2016 р.
Greetings! It is time to release new beta version of Adguard for Mac. There is quite a bit of various fixes and changes here, as you can see in the changelog below, but the most important, or rather the most impactful ones, are those that affect performance. Specifically, we mean #88 and #91. Optimizing basic filtering rules (#91) processing is very important since basic rules are the most resourse-consuming among all. #88 also deserves attention. Now we lower resourse consumption significantly during the 'idle time'. Overall, Adguard will become faster now, but not only that. Thanks to the better performance, Adguard will now consume significantly less battery resourse. версія 1.1.5 (beta) від 9 лютого 2016 р. [Added] $replace modifier for basic rules. [Changed] Suppress browser cache after filtering startup for a short period of time. [Changed] Improved compatibility with sites that use the Content-Security-Policy mechanism. [Fixed] Modifiers for the whitelist rules do not work while filtering the content. версія 1.1.4 (beta) від 20 січня 2016 р. [Added] New localizations: Serbian (Latin), German, Italian, Spanish (Spain), Chinese Traditional, Armenian, Turkish, Korean, Indonesian, Hungarian. [Added] User warnings in case HTTP proxy mode fails to start. [Changed] SHA-1 certificate outdating is now taken into account. [Changed] User filter is now loaded last, after all other filters are loaded. [Changed] Now $popup rules modificator is also applied to server redirect responses. [Fixed] Error previously led to inability to change HTTP proxy port with HTTP proxy mode enabled. [Fixed] Lack of explanation text in the 'Enter email address' text field. [Fixed] Template modificator * in rules now takes into account line break symbols. версія 1.1.3 (beta) від 22 грудня 2015 р. [changed] Now clicking on Adguard icon in status bar brings opened Adguard windows to front and makes them active. [changed] Now status 500 is always returned for blocked requests. [changed] Assistant requests are now excluded from 'Filtering log'. [fixed] Problem when Adguard extension for Google Chrome couldn't see triggered $genericblock rules. Integration mode works correctly now. [fixed] Problem when Adguard caused browser to freeze. [fixed] Problem when basic rules were treated as rules with $popup modificator. версія 1.1.2 (beta) від 16 грудня 2015 р. [changed] If a website requires client certificate at SSL connection, then Adguard will pass traffic without filtering it. [changed] Updated list of SSL exceptions. [changed] Port on which Adguard accepts connections. [changed] A method of domain check with Browsing Security filter. Improved privacy of requests. [fixed] Third-party requests filtering error. [fixed] Error in css-inject rules. [fixed] Safari inability to connect to some websites with IPv6 network configuration. [fixed] Now $elemhide rule modifier is applied only to HTML-pages. [fixed] Error in finding the elements path on a page for HTML filtering rules. [fixed] Error in HTML filtering rules – empty elements were never removed. [fixed] Blocking of Google Chrome Rapportive extension for Gmail. версія 1.1.1 (beta) від 22 жовтня 2015 р.
версія 1.0.101 (beta) від 24 серпня 2015 р. Fixed an issue with OCSP staple check when valid cert might be considered as invalid. версія 1.0.99 (beta) від 14 серпня 2015 р. Added first launch tutorial screen. Added support for browsers: Firefox Nightly, Chrome Canary. Improved root certificate installation method for Mozilla-based browsers. Fixed error previously preventing rules with particular symbols from traffic filtering. Fixed error previously causing incorrect Adguard closing. версія 1.0.85 (beta) від 9 липня 2015 р. Improved security for adding Adguard Assistant to web pages. Improved mechanism of generating a root certificate and a private key for SSL connections. Fixed Logjam exploit (Adguard no longer filters connections with weak keys). Restricted access to the functions of userscripts API. Now when switching to sleep mode on Mac, Adguard closes the current network connections. Changed installation process, fixed problem when Adguard won’t work after restoring Mac from Time Machine. Fixed an error which led to the crash of previous beta version. версія 1.0.79 (beta) від 18 червня 2015 р. Significantly increased list of browsers filtered by default. Added localizations: Chinese (simplified), Korean, Polish, Portuguese (Brazil), Slovak, Korean. Added function to send a report upon unexpected Adguard shutdown. Improved filtering rules correctness check. Altered SSL-connections cipher suite to a modern one. Now Adguard automatically suggests to install root certificate into Firefox if there is none, to allow HTTPS pages filtering. Fixed issue when Adguard won't respind to users actions while watching a YouTube video. Fixed error lead to Adguards crash while visiting a website with incorrect HTML. версія 1.0.59 (beta) від 15 квітня 2015 р. Fixed an error that used to decrease filtering speed in previous beta update, instead of increasing it. версія 1.0.58 (beta) від 13 квітня 2015 р.
версія 1.0.56 (beta) від 1 квітня 2015 р.